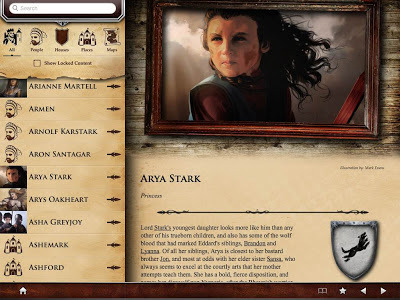 Home » a song of ice and fire , apps , books , fantasy , game of thrones , george rr martin , ipad , iphone , ipod touch » "Winter is coming"... and this iOS app will help guide your way! "Winter is coming"... and this iOS app will help guide your way! Last spring I added a new vice to my list of stuff worth spending valuable time on. I haven't spoken about it on this blog yet but those who know me best will tell you that I have become a huge fan of A Song of Ice and Fire (AKA Game of Thrones), the fantasy novel series by George R.R. Martin. Kristen gave me a Barnes & Noble gift card for my birthday last year and I used it to buy A Game of Thrones. When June rolled around I wound up taking A Feast for Crows along on our trip to Oregon. And just before Christmas I finished the most recent book, A Dance with Dragons. I am digging the heck out of this series! My three absolutely favorite characters are Jon Snow, Arya Stark and Tyrion Lannister. Especially Tyrion: it's impossible to get enough of that guy! Jon and his direwolf Ghost - with the Wall behind them - are the wallpaper on my desktop and iPad. And if I ever have a daughter someday I hope she's even half as spunky as Arya is. And all of this was before I had even watched HBO's Game of Thrones, the acclaimed television series based on the books. I just finished the Blu-ray set of Season 1 and am looking forward to getting Season 2 when it comes out. Maybe there'll be a way I can sneak some premium cable by the time Season 3 begins late next month. I can see now why Peter Dinklage earned that Emmy: his portrayal of Tyrion is the most electrifying character on television lately. "Stick them with the pointy end!" While we're waiting for the next volume, The Winds of Winter, to get published one of these daysyears, if you're also a fanatic for all things Westeros and have an iPad or other Apple gadget then you should check out A World of Ice and Fire app for iOS devices. It's not as thorough as A Song of Ice and Fire Wiki and it isn't as definitive as it could (and let's hope eventually will) be, but as a basic guide for the Game of Thrones it comes pretty handy. The app is loaded with character biographies, genealogical info (so you can keep track of which is Robert Baratheon and Robert Arryn, who I'd love to see thrown through the Moon Door someday), maps of the various regions, some really nice artwork of many of the characters and locations... all things considered good enough to recommend for downloading from the App Store. It's not "perfect" but it still ample merit for some positive mentioning. There is even an option that will keep "spoilers" hidden until you've completed reading any book in the series. It's a free app but some features you'll have to pay for. Even so, it can be pretty useful while following the machinations, manipulations and myriads of characters fighting to control the Iron Throne!